When you’re trying to find a blend of luxury and welcomed informality, The Trafalgar Dining Rooms set within The Trafalgar St. James, boasts a prime London location for this recently opened stylish dining experience. As you walk through the entrance, you’re welcomed (and immediately drawn into) the chic and inviting central bar. Brightly lit, it is an ideal after work drinks or pre-theatre location for its visitors and pays tribute to its iconic location. Settling in for a cheeky pre-dinner aperitif, the cocktail list tips its hat to the history of the building and surrounding location with its aptly named Mistress Emma – Lord Nelson’s infamous mistress, to the ever changeable Fourth Plinth cocktail. 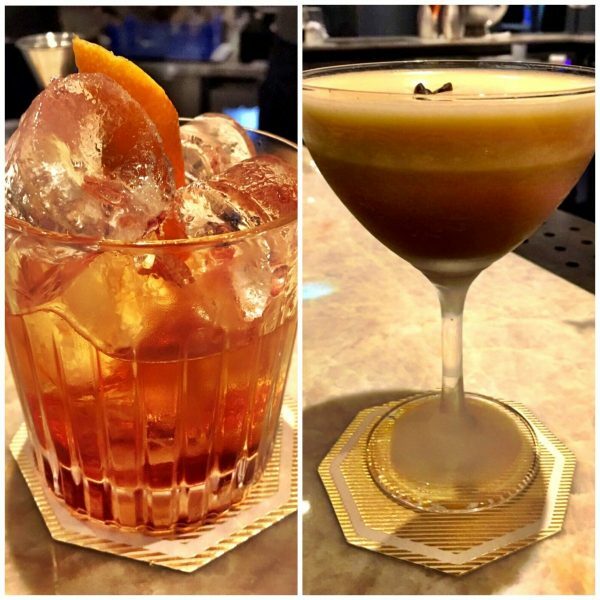 We chose the more traditional cocktails – the 150lbs Espresso Martini (£12) (made with 150lbs of coffee liqueur) which was smoothly blended and creamy and a damn fine Old Fashioned (£13). Its extensive drinks menu stocks a full range of wines, spirits and a concise selection of American beers which we unfortunately didn’t have time to try this time. Whether you’re here with business associates, a group of friends or with a date to impress, it’s the type of place you’re in danger of not wanting to move once relaxing into its stylish high tables or cosy booths! However, we firmly recommend you do so. Behind the bar area is the expansive dining room, providing the ambience of 1920s glamour with its tall ceiling, curved booths and softly lit deep blue décor. Under the helpful assistance of our waiter Bruke, we were wisely recommended the courgette fritters (£11) with garlic mayonnaise which were delicious. 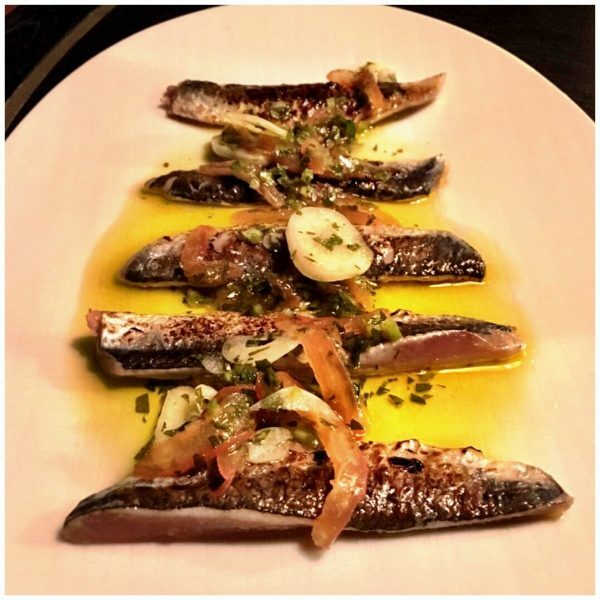 We also ordered the sardines (£8) and the tomato cooled the hit of the garlic and green chilli. The Muscadet wine (£37 for a bottle of the 2015 Sevre Et Maine Sur Lie), was light and fruity and a lovely accompaniment to the freshness of our starters. For mains we ordered the salmon (£15), again upon Bruke’s recommendation and two for two it was a great choice. Soft and tender, the salmon was accompanied by a piquant Chraimeh sauce which provided warmth alongside a tasty and zesty side of raw artichoke and herb salad. The lamb rump (£24) was cooked to perfection as suggested served medium-rare with a side of spiced chick peas with chilli flakes and fennel which was cooled by feta, broad beans and mint. 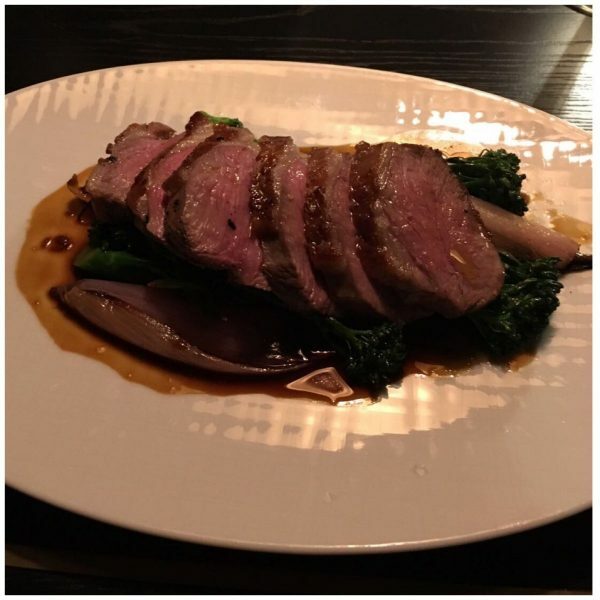 The flavours of the lamb called for a richer wine choice and so I enjoyed a warming glass of Pulenta Estate Malbec (£14) which was a great match on an autumnal evening. 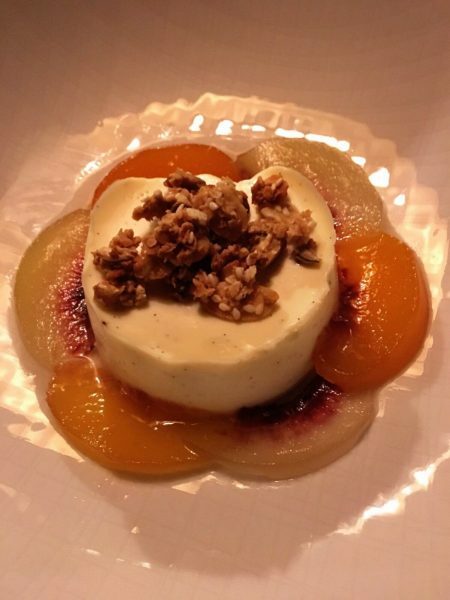 Finally, for desserts we opted for the buttermilk panna cotta with poached pears (£8). Light and creamy and beautifully presented this was easily (perhaps a little too easily) devoured. I couldn’t help but feel a hint, just a hint, of food envy with my guest’s choice of dessert though. The perfect seasonal comfort choice was the rich warm date and walnut cake (£8) with its stem ginger ice cream. Another glass of Malbec and I may have just curled up in the booth for the night with that dessert! Before we left, Karim the Rooftop General Manager gave us a little sneak preview of the brand new hotel rooftop where you can now enjoy drinks and an Asian fusion menu either from the outdoor covered seating area, the balcony area, or in the lavish glasshouse ROOM which is available for private hire. Boasting views of central London’s skyline, from the Shard, the London Eye and of course Trafalgar Square, the rooftop will certainly be a summer time draw and a hideaway from the bustling city centre. For a truly luxurious New Year’s Eve celebration, why not hire the ROOM with unlimited food across seven courses, champagne and spirits at a mere £15,000, available to book through Bookatable.